This is a question many school administrators have asked recently as they review their technology budgets. The answer to the question is probably “yes,” because school cafeteria POS systems offer a variety of advantages not afforded by traditional electronic cash registers. Let’s take a look at some of these benefits. Students at K-12 schools typically have a very short window of time in which to purchase and eat their lunch, while those enrolled at colleges and universities are often on tight schedules between classes. With such features as custom screen layouts, quick card processing (“smart cards” for K-12 students and meal cards and/or credit and debit cards at the secondary level), and packaged commands, school cafeteria POS systems keep lines moving, ensuring that students consistently enjoy as much time as possible to consume their food. Cafeterias cater to hundreds or even thousands of students daily, meaning that they must manage a very sizeable inventory of perishable and non-perishable food and beverage items. They must ensure that they have sufficient quantities of ingredients and food on hand at all times, and that these items haven’t expired. Some schools must also follow federal guidelines that dictate which items they can and cannot serve, and to whom. A cafeteria POS system with an inventory management module makes it easier for schools to rise to these challenges. Cafeteria administrators and other appropriate personnel can calculate food costs by recipe and, through usage reports, get a firm handle on inventory in stock. This permits shortages and overages to be addressed proactively, eliminating waste and ensuring that food is used by its expiration date. The inventory management component of the cafeteria POS system can also be programmed to generate orders only when item levels have been depleted to a certain threshold, and to prevent the processing of orders that don’t meet certain parameters. 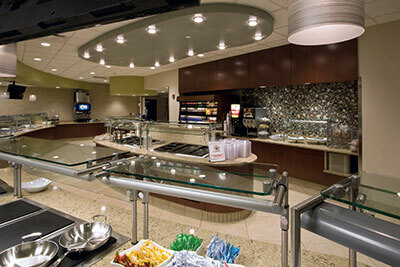 Consequently, cafeterias are assured of having the right quantities of the right ingredients at the appropriate time. Waste is minimized, and adherence to all purchasing guidelines becomes the norm. Busy parents can forget to give their children lunch money. Occasionally, they can even find themselves ready to send their children to school, only to discover that they have no cash for lunch. By contrast, in schools with cafeteria POS systems, parents can simply load money onto students’ prepaid cards once a month (or in some districts, once a week). Parents are happy because there is no need to scramble for coins and bills every day, and children are happy because they no longer need to skip lunch or borrow money from a friend. Additionally, some cafeteria POS systems give parents an extra measure of control over which food items their children can and cannot buy in the school cafeteria. In these cases, student profiles are maintained in a database and, because of an interface with the POS, cashiers cannot process the purchase of any item a parent has deemed “forbidden.” This system allows parents to do payment for the entire family through one student. Wordare, Inc. provides e-Funds For Schools to allow families to choose a couple of different online payment options for student lunch accounts. Parents may choose to have payments automatically withdrawn electronically from your checking account or charged to your credit card. There is a convenience fee for using this program. The benefits of cafeteria POS systems far outweigh the initial cost, making them a worthwhile investment for any school, K-12 or secondary. Why do I need a LCS account? Our easy to use features make managing your family’s school lunch accounts easy! Don’t have a family account yet? Create a free account for your family today to take advantage of our online services. Our easy to use features make managing your family’s school lunch accounts easy! Wordware, Inc., founded in 1983 and headquartered in Mendota Heights, MN, provides software applications for cafeteria business. Wordware’s LCS mayflower system is expandable to concessions, school store and could be integrated with Student information system, which makes perfect advance solution for your school. Wordware Inc, Lunch payment system is a simple and secure way for schools to connect, transact and manage all their school payments solutions. POS system that will simplify order-taking, offer detailed sales and inventory tracking, and make managing your employees and customers a breeze. Author anuruddhaPosted on June 16, 2016 Categories Cafeteria Software, Software for Cafeteria, Software for School CafeteriaTags Grocery POS, Group POS Hospitality, Hotel POS, Integration POS, l POS Markering tools, Liquor control low foot print POS, Loyalty POS, loyalty Stock contro, Multi Venue POS, paging Point of Sale system, PLU free POS point of sale, POS Membership POS, POS POS handheld POS, POS system, POS systems, POS terminal, POS terminals, POS touchscreen, POS upgrade, Restaurant POS, Restaurant software, Rewards Sales reports, software POS solutions, Takeaway POS Touchscreen VouchersLeave a comment on Cafeteria POS: Your Schools Need Point of Sale Systems, Wordware’s LCS 1000 Mayflower is best choice. Segregated Charter Schools Evoke Separate But Equal Era in U.S.
At Dugsi Academy, a public school in St. Paul, Minnesota, girls wearing traditional Muslim headscarves and flowing ankle-length skirts study Arabic and Somali. The charter school educates “East African children in the Twin Cities,” its website says. Every student is black. At Twin Cities German Immersion School, another St. Paul charter, children gather under a map of “Deutschland,” study with interns from Germany, Austria and Switzerland and learn to dance the waltz. Ninety percent of its students are white. Six decades after the U.S. Supreme Court struck down “separate but equal” schools for blacks and whites, segregation is growing because of charter schools, privately run public schools that educate 1.8 million U.S. children. While charter-school leaders say programs targeting ethnic groups enrich education, they are isolating low-achievers and damaging diversity, said Myron Orfield, a lawyer and demographer. Charter schools are more segregated than traditional public schools, according to a 2010 report by the Civil Rights Project at the University of California, Los Angeles. Researchers studied 40 states, the District of Columbia, and 39 metropolitan areas. In particular, higher percentages of charter-school students attend what the report called “racially isolated” schools, where 90 percent or more students are from disadvantaged minority groups. In Minnesota, the birthplace of the U.S. charter-school movement, the divide is more than black and white. Charter schools, which select children through lotteries, are open to all who apply, said Abdulkadir Osman, Dugsi’s executive director. That’s a “significant difference” between Minnesota charters and segregated schools in the 1950s South, said Joe Nathan, director of the Center for School Change at Macalester College in St. Paul. “Nobody is being forced to go to these schools,” said Nathan, who helped write Minnesota’s 1991 charter-school law. Ever since Horace Mann crusaded for free universal education in the 19th century, public schools have been hailed as the U.S. institutions that bring together people of disparate backgrounds. The atomization of charter schools coincides with growing U.S. diversity. Americans of other races will outnumber whites by 2042, the Census Bureau projects. “The nation’s schools strive to teach that our strength comes from people of different races, creeds, and cultures uniting in commitment to the freedom of all,” Kennedy wrote. Citing Kennedy’s words, U.S. Secretary of Education Arne Duncan and Attorney General Eric Holder this month called for schools — including charters — to combat growing segregation. Along with breeding “educational inequity,” racially-divided schools deny children the experiences they need to succeed in an increasingly diverse workplace, Duncan said in announcing voluntary guidelines for schools. Charter schools may specialize in serving a single culture as long as they have open admissions, and there’s no evidence of discrimination, said Russlynn Ali, assistant education secretary for civil rights. The education department is encouraging charter schools to promote diversity. Charters could expand recruiting and consider lotteries that give extra weight to disadvantaged groups, such as families living in low-income neighborhoods or children who speak English as a second language, Ali said in a phone interview. Minnesota, 85 percent white, is a case study of the nation’s growing diversity. Since the 1970s, Minneapolis and St. Paul have become a magnet for Hmong refugees, who fought alongside Americans in the Vietnam War. In the 1990s, Somalis sought refuge from civil war. St. Paul, where the nation’s first charter school opened in 1992, is 16 percent black, 10 percent Hispanic and 15 percent Asian-American, according to the U.S Census Bureau. Charter schools should be similarly diverse, recommended a 1988 report that provided the groundwork for Minnesota’s charter-school law. “We envision the creation of schools which, by design, would invite a dynamic mix of students by race and ability levels,” the Citizens League, a St. Paul-based nonprofit public-policy group, wrote in the report. Instead, in the 2009-2010 school year, three quarters of the Minneapolis and St. Paul region’s 127 charter schools were “highly segregated,” according to the University of Minnesota Law School’s race institute. Forty-four percent of schools were 80 percent or more non-white, and 32 percent, mostly white. Segregation is typical nationwide. Seventy percent of black charter-school students across the country attended “racially isolated” schools, twice as many as the share in traditional public schools, according to the report from the Civil Rights Project at UCLA. Half of all Latino charter-school students went to these intensely segregated schools, the study found. In the West and the South, the two most racially diverse regions of the country, “charters serve as havens for white flight from public schools,” the report said. They also serve as havens for minority students who need extra help, said leaders of Minnesota charter schools. Christianna Hang, founder of Hmong College Prep Academy, said she designed the school so children, mostly first-generation Americans, didn’t feel adrift in public schools as she did when she arrived in the U.S. in 1980. In the Hmong academy’s central hallway, a tapestry depicts families living in Laos, fleeing the Vietnam War and arriving in America. The school’s roughly 700 students, in grades kindergarten through 12th grade, learn Hmong. In the 2009-2010 school year, 26 percent of Hmong Academy students met or exceeded standards on state math exams, while 30 percent did so in reading. About half passed those tests in the St. Paul Public School District. To raise expectations, classrooms adopt colleges, hanging banners from Harvard University, Yale University and Dartmouth College over their doors. Dugsi Academy, the school for East Africans, and Twin Cities German Immersion School make for some of St. Paul’s sharpest contrasts. Until this school year, the two schools were neighbors, across a busy commercial thoroughfare in a racially diverse neighborhood. At different times of the day, the kids used a city playground in front of the German school for recess. Dugsi has since moved three miles away, across a highway from the Hmong academy. The German Immersion School is a bright, airy former factory with exposed brick and high ceilings. “Eva, was ist das?” kindergarten teacher Elena Heindl asked one morning earlier this month as she pointed a red flashlight to letters, eliciting the name of each one in German. To succeed at the school, students must be fluent in German to enroll, unless they enter before second or third grade, Julie Elias, a parent, told prospective families on a tour this month. “You can’t just move into the neighborhood if you want to go to our school,” Elias said. The school is legally required to take anyone picked in its lottery, though it counsels parents against enrolling in older grades without German knowledge, said Annika Fjelstad, its director. The school, which includes many families with one parent who speaks German or that have German relatives, holds special events at the Germanic-American Institute in a $1.3 million St. Paul house with a ballroom. Children like to call the institute “our school’s mansion,” said Chris Weimholt, another parent giving the tour. In the 2009-2010 school year, 87 percent of children at the German school passed state math tests and 84 percent did so in reading, according to the Minnesota Department of Education. Fifteen percent qualify for the federal free or reduced lunch program, compared with 71 percent in St. Paul. The school doesn’t offer bus transportation, so most parents drive, often carpooling, Elias said. The language requirement and lack of transportation prevents poor families from attending, said Greiling, the state legislator, who has toured the school. The German program doesn’t have buses because they would cost $100,000 a year, too heavy a burden for an expanding school of 274 that wants to maintain classes of 20 students, Fjelstad said. An immersion school can’t take kids who aren’t fluent after early grades, she said. In February, the school formed an “inclusivity” task force to find ways to make the school more reflective of the community, Fjelstad said. The school will try to improve recruiting through its relationship with community organizations, such as a neighboring YMCA, she said. So does Dugsi Academy. Children learn Arabic and Somali along with English and traditional academic subjects. A caller last month heard no English on a school voice mail. One morning in late November, a sixth-grade social-studies class discussed immigration with 28-year-old Khaleefah Abdallah, who himself fled Somalia 12 years ago. The boys wore jeans and sweatshirts. The girls sported hijabs, or traditional Muslim head coverings with skirts or long pants. Abdallah asked his class about the idea of the American “melting pot:” immigrants assimilating into U.S. culture. He suggested another metaphor, a “salad bowl,” where people from different backgrounds mix while retaining their own identity. Students shared stories of the challenge of co-existing in mainstream America. Ahmed Hassan, 12, complained about a boy on a city playground who made fun of the long traditional robe he wore one Friday. “He told me it looked like a skirt,” Hassan said. Abdallah told the class that, under the U.S. constitution, Americans have the freedom to express themselves through their clothing. Dugsi, a low-slung red-brick building in an office park, has about 300 students in kindergarten through eighth grade. Almost all qualify for federal free or reduced lunches, according to the state. Only 19 percent passed state math exams in the 2009-2010 school year, while 40 percent did so in reading. The school’s test scores reflect families’ backgrounds. said Osman, the Dugsi director and a former employee of the U.S. Embassy in Somalia, who emigrated to the U.S. in 1993. Parents work as cab drivers, nurses and grocers, Osman said. Many had no formal schooling. It would be better if one day Somali students could go to school with children from other backgrounds, Osman said. Author anuruddhaPosted on May 11, 2016 Categories Cafeteria Software, Nutrition Softwares, School Lunch Software, Software for CafeteriaLeave a comment on Segregated Charter Schools Evoke Separate But Equal Era in U.S. Processors and ingredient suppliers need to collaborate in creating meals that are nutritious and desirable for this picky and often overweight demographic. School lunch nutrition programs come in as many forms and approaches as there are school districts. But one constant is that budgets are always tight. However, processors who participate in the efforts to better feed our children can find satisfaction in not only doing the right thing but in creating products for a significantly large demographic. Case in point: The New York school system alone serves more than 1 million meals per day. That according to Leigh and colleagues Terri Whitacre, director of school food and nutrition services for the Charlotte County Public School System in Punta Gorda, Fla., and Stacey Wykoski, foodservice director for the Jenison/Hudsonville School Food Service group in Jenison, Mich. The three provide recommendations that manufacturers “should avoid MSG, high-fructose corn syrup, nitrates and items that are known to be issues in the food supply.” They also believe that GMOs are going to be a “big topic” moving forward. “Manufacturers also need to take the lead in better food labels: sugar listed on a label should refer to added sugars, not natural and added combined,” they note. There are huge challenges facing any program designed to feed wholesome, desirable meals five days per week to hundreds of kids at a time in three or more 30 minute blocs around the noon hour. The biggest, perhaps, is an endless schoolyard tug-of-war between the cost of production and the staggering cost of plate waste. According to the USDA, the healthier meal requirements are a “key component of the Healthy, Hunger-Free Kids Act” First Lady Michelle Obama has taken on following her Let’s Move! campaign. Ensuring students are offered both fruits and vegetables every day of the week. Substantially increasing offerings of whole grain-rich foods. Offering only fat-free or low-fat milk varieties. Limiting calories based on the age of children being served to ensure proper portion size. School Food Service Manager is a certified food handler (local or national certification). School has a Farm to School initiative: Local and/or regional products are incorporated into the school meal program. Messages about agriculture and nutrition are reinforced throughout the learning environment via activities such as: school gardens; signage, promotions or special events such as tastings that emphasize local products; field trips to local farms; and curriculum integration. Smarter Lunchroom techniques are used to encourage fruit consumption. Fruit is displayed in two locations, one of which is near the cash register, on all lunch lines. Attractive displays, signage and staff encouragement are used to draw attention to the fruit and encourage children to select them. Smarter Lunchroom techniques are used to encourage vegetable consumption. Students are given the opportunity to provide input into vegetable offerings and to identify creative/descriptive names for the offerings. Creative/descriptive names are displayed with vegetables on the lunch line as well as on a poster or menu board outside the school cafeteria. When offered, dark green, red and orange vegetables and dry beans and peas are displayed first or most prominently among vegetable side dishes on the lunch line. Smarter Lunchroom techniques are used to encourage consumption of dry beans and peas. Entrees that include dry beans or peas are displayed first or most prominently on the lunch line amongst other entrée items on at least two days. Dry bean and pea entrée items are given creative/descriptive names with student input. Grab-and-go reimbursable meal options include dark green, red and orange vegetables, and/or dry beans and peas at least one day per week. Details and downloadable versions of the complete requirements are available at www.usda.gov. Infinity Retail Café Renovation and Expansion at Aurora Medical Center Kenosha in Kenosha, Wis.
A small linear retail location barely met the needs of visitors and staff at Aurora Medical Center Kenosha for many years. But an ever-expanding outpatient population paired with the hospital’s expansion to 73 inpatient beds eventually rendered the existing space insufficient. However, the project could not add any additional space to the building, so the design team used a former seating space to enlarge the servery to 1,235 square feet. 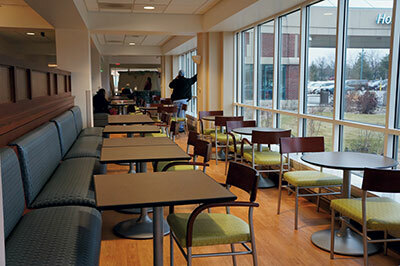 The café also includes a 1,500-square-foot seating area that can accommodate 88 people. A corridor divides the seating area in half, yet allows natural light to penetrate into both areas. A new café feature is a private dining room. Creative planning, such as shaping the salad bar to fit in a limited amount of space, opens up space for multiple menu options. Photo courtesy of Zimmerman Architectural StudiosThe larger space allows for increased and better traffic flow, giving customers much more room to see menu options, which also increased substantially. For example, a grill station with a flattop features a new gourmet burger concept called Hungry Burgers as well as daily specials. The entrée station contains an exhibition action station featuring healthy entrées and salads made to order. Another popular new feature, the display cooking station, necessitated adding an exhaust hood onto the existing building. “This was the biggest challenge so we added it toward the back where it could be the most easily accommodated,” Guyott says. A new sub concept named First Edition Grinders adds to menu items available in a deli area that also features specials made to order. Naan Za, a new gourmet pizza concept, features naan pizza crust with a variety of toppings. The hot food and deli stations back up to the kitchen. The positioning allows staff to easily replenish the stations’ food items via a pass-through hot/cold unit from the adjacent kitchen. Refrigeration sits beneath the grill, flattop and charbroiler providing staff with easy access to ingredients during production. Refrigerated prep tables at the hot station and sandwich station also contribute to staff easily moving cold food prep from the kitchen into this space during down times. Customers can choose among 88 dining seats, including single countertop seats overlooking the exterior courtyard, 2-tops for more privacy, banquettes of 2 or 4 for flexibility, a large table for group settings and several 4-tops. Photo courtesy of Aurora Medical Center Kenosha; photography by Bruce ParkerStaff working at the hot food and deli stations use high speed ovens as an alternative to fryers, versatile hot and cold wells, pass-through hot/cold units, open-air merchandising units, shaped steam pan inserts and serving casserole pans. “Space was still limited so there was a focus on the use of lineal countertop space for merchandising,” Guyott says. “We designed a uniquely shaped salad bar that customers access for salad on the front side and snacks on the back side.” Customers can select from 40 rotating and occasionally themed menu items at the salad bar, which contains color-coated aluminum inserts. 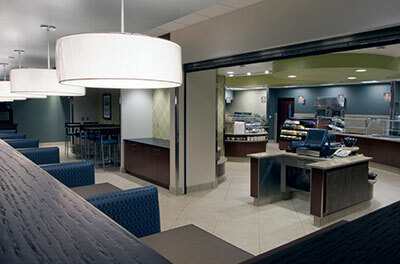 The café also features a dessert station and cold and hot beverages. Another labor-saving solution puts the cash register station on wheels so staff can move it to the end of the hot food station. “This allows the entire retail area to remain open and staffed with one person during weekends and evenings when transactions are low,” Guyott says. Staffing: 2 until 10:30 a.m.; 3 from 10:30 a.m. until 11:30 a.m.; 4 for lunch from 11:30 a.m. until 2 p.m.; 3 until 2:30 p.m.; 2 until 3 p.m.; and 1 from 3 p.m. to 6:30 p.m.
Foodservice design: Robert Rippe & Associates, Minneapolis; Christine Guyott, FCSI, RD, principal; Joy Enge, RD, senior equipment specialist; and Amy Fick, senior project manager. Author anuruddhaPosted on May 11, 2016 Categories Cafeteria Software, Food Service Software, Software for CafeteriaTags cafeteria payment system, cafeteria program, food service management software, lunch program, Point of sale softwareLeave a comment on Infinity Retail Café Renovation and Expansion at Aurora Medical Center Kenosha in Kenosha, Wis. The School Breakfast Program (SBP) provides cash assistance to states to operate nonprofit breakfast programs in schools and residential childcare institutions. The U.S. Department of Agriculture’s (USDA) Food and Nutrition service administers the SBP at the Federal level. State education agencies administer the SBP at the state level, and local school food authorities operate the program in schools. The National School Lunch Program (NSLP) is a federally assisted meal program operating in public and nonprofit private schools and residential child care institutions. It provides nutritionally balanced, low-cost or free lunches to children each school day. For this benefit program, you must be a resident of the state of New Jersey. Income eligibility guidelines are used to determine eligibility for free and reduced priced meals or free milk. If you are earning at or below current Income Eligibility Guidelines, we encourage you to contact your school to fill out a school meal application. The school or local education agency will process your application and issue an eligibility determination. If you are receiving Supplemental Nutrition Assistance Program (SNAP) benefits, your child automatically qualifies for free school meals. If you are eligible for unemployment compensation, you might also be eligible for free or reduced price school meals. Because many programs offer services to families that may qualify them under other local criteria, we strongly recommend you contact the program in your community for more information and guidance. Schools send school meal applications home at the beginning of each school year. However, you may apply for school meals at any time throughout the school year by submitting a household application directly to your school. Your school will provide you with an application upon request. Contact your state’s agency to participate. For additional information, please visit the New Jersey School Nutrition Programs page. Rep. Paul Ryan (R-Wisc.) apparently doesn’t believe the government should give poor children free school lunches, and he used a possibly plagiarized story to make his point. She once met a young boy from a poor family. And every day at school, he would get a free lunch from a government program. But he told Eloise he didn’t want a free lunch. He wanted his own lunch — one in a brown-paper bag just like the other kids’. He wanted one, he said, because he knew a kid with a brown-paper bag had someone who cared for him. According to Ryan, this is proof that liberal programs are leaving Americans with “a full stomach and an empty soul.” But there are problems with Ryan’s story beyond the implication that poor children shouldn’t get school lunches: His story is likely plagiarized and almost certainly fake. As Wonkette and New York Magazine note, Ryan’s story bears a striking, if distorted, similarity to a story in the book “An Invisible Thread.” In the story, a New York schoolteacher offers to buy a panhandling student lunch, and he insists that it has to come in a brown paper bag, because all the other children with lunches in brown paper bags have parents who love them. It’s not a condemnation of giving children free lunches — it’s a reminder to give generously to people in need. It appears that as distorted as Ryan’s story was, however, he wasn’t the one doing the twisting. N.Y. Mag points out that Ryan likely did hear the story from Anderson, who delivered almost the exact same story in a congressional hearing last July. Anderson instead that the story had happened to her personally and used the fictional encounter to claim that “we need to be very careful about how we provide programs to families that don’t undermine families’ responsibilities.” It seems unlikely that Anderson would have met a child with this exact same story. What’s more likely is that Anderson lifted the story to make her point and Ryan liked it enough to reuse it. Ryan’s story may be plagiarized, but it appears to be an accident on his part.